The second day of Fall Break began with me at the local iHop enjoying a hearty breakfast to carry me through ten miles of hiking at nearby Lake Ouachita. After driving 20 miles to the lake, I stopped in at the visitor center to pick up their trail maps for the Caddo Bend trail and Little Blakely trail system, all of which are along peninsulas sticking out from the lake’s eastern shore. 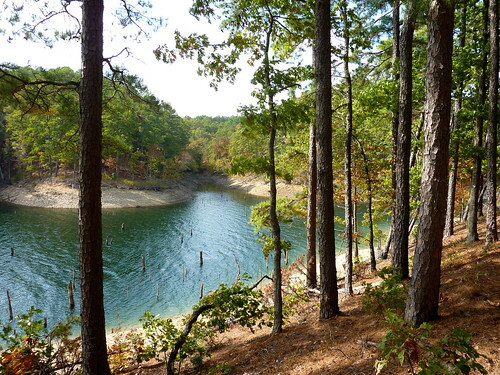 It was a short walk to the Caddo Bend trailhead to start the walk westward down the peninsula. The trail soon ran by a boulder field and then dropped to the lake shore. The sun struggled to break through the overcast all morning, so the light was not ideal. You will spot some rocks intruding onto the gravel shoreline – the peninsula is known for its geological variety, with a folded mixture of rocks, including quartz. Eventually I reached the end of the peninsula, which is Point 50 on the lake. Here one found the tilted planes of sedimentary rock exposed and leading out into the water. Clambering out onto the point, I could look back at the lake sign and note how large chunks of one thick vein of rock had broken off. On the north side of that vein were thin planes of multicolored rock. I set a branch of small pine cones down beside it for scale in a close-up. Some rocks had veins of quartz running through them, and I located one where the rock had fallen away to expose the vein. I had spied a small cave down the rugged shoreline, and carefully scrambled over the ever-changing types of rock to reach it, including a large conglomerate protrusion looking like stones caught in petrified tar. The north side of this protrusion was fascinating in its erosion. I placed a trekking pole against it for scale. After considerable struggle, I finally reached the cave and posed for a shot. At one point on my journey I had to shimmy down a steep rock face, so I knew I would not be returning that way. Thankfully ahead I could see eroded bedding planes rising up toward the wooded top of the peninsula. Walking up them I found more quartz and tree stumps as I groped my way up through the brush to finally rejoin the trail. Soon I was walking eastward along the peninsula’s north shore. There were a couple of footbridges to save me from winding my way back every inlet, and my low approach to one of them inspired me to shoot the leaves along the deck, with the bridge railings emphasizing the perspective. The remainder of the trail was uneventful, so after hiking in silence all morning I finally flipped on an audiobook as I wrapped up the four mile loop. Then I took gravel roads to the north out of the park to reach the Little Blakely Trail System, a series of loop trails on the next peninsula to the north. Several loops run along old forest roads, and there are helpful marker maps at each trail junction to help you navigate. I decided to walk the South Loop since I’d found the south shore of the Caddo Bend peninsula more interesting than the north. Just after the trailhead was a picturesque creek. The wide road trail worked its way up through the forest down the peninsula and then turned south, finally offering a view of a small wooded island out in the lake. I stopped near a large pine tree to dine on another turkey sandwich I’d picked up at a convenience store. A break in the trees offered a better view of the island beyond. This section of the trail was not an old road, so it was considerably narrower. At times the growth forced me to sidle sideways along, but thankfully most of the trail was quite clear. The trail wound around multiple inlets, with the gravel shore tracing various past lake levels. I took a side loop that ran out to a point and snapped shots of a downed (or should I say drowned?) tree and a quartz fire ring. The view of the lake was entrancing with its undulating shoreline. This side trail ran along steep hillsides and was the most challenging part of the hike, except for my bushwhacking adventure along the rocky western shore of Caddo Bend north of Point 50. A footbridge with interesting suspended rail bracings brought the hike to a close. I then drove back into the park, stopping at the Three Sisters Spring, where three springs emerge in close vicinity and their waters are channeled into three rivulets. I was amused that whereas people used to drink from each spring for different ailments, the state now cautions visitors that the water is not potable. At least it doesn’t stink like the springs at Oklahoma’s old Platt National Park, now the Chickasaw National Recreation Area. Above the spring was a picturesque abandoned pump house falling into ruin. I must say that the whole setup at Three Sisters looked suspiciously like they were just pumping water rather than relying upon natural flow. The day ended with me driving back to Hot Springs to shower before heading out to dinner with my friend and fellow science teacher Betty Henderson and members of her extended family. Betty and one of her brothers, with his wife and son, had been digging crystals all day at the Ron Coleman Mine up north of town. They said they had enjoyed the long day of digging in the mud for the glistening quartz and had gathered some sizable crystals, but I’m glad my own geological adventure was scrambling about the rocks at Point 50. Tomorrow I plan to hike a bit on the Athens-Big Fork trail, an old mail route just west of Winding Stairs Trail. Click here for a slide show of today’s hike.